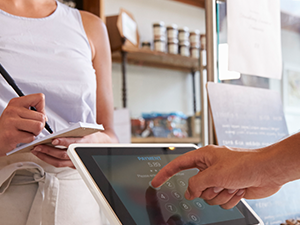 Using your business debit card is a simple way to pay for everything your business needs. You can request debit cards that you, or your employees, can use to access money from your Hillcrest Bank business checking account. Get direct access to your checking account with your business Visa debit card. Accepted at more than 35 million merchants, and online, it makes paying for items your business needs to purchase easy and convenient. All of our debit cards are embedded with an EMV chip, which provides extra levels of security against fraud. Your card also comes with Visa’s Zero Liability policy1, continuous fraud monitoring, and 3-digit security code to verify your identity for internet and phone purchases. Save money on your business spending and earn automatic discounts by enrolling your debit card in the Visa SavingsEdge2 program. Q: How do I order a new debit card? A: To order a new debit card, please visit your local banking center. Q: How do I temporarily lock my card? A: If your card has been lost or stolen, please call your local banking center or our Client Services and Solutions team at 855.629.7618. Q: What should I do if my card is lost, stolen or I suspect fraudulent debit card transactions? A: To report a lost or stolen Debit or ATM card please call 866.392.9952, your local banking center or our Client Services and Solutions team at 855.629.7618. For more frequently asked debit card questions, please visit the Business Banking Frequently Asked Questions page. If you don’t have a Hillcrest Bank business debit card yet, what are you waiting for? Stop by one of our convenient banking centers to request one, today! 1The Visa Liability policy covers U.S.-issued cards only. Does not apply to ATM transactions, certain commercial card transactions, PIN or other transactions not processed by Visa. You must notify Hillcrest Bank immediately of any unauthorized use. For specific restrictions, limitations and other details, please contact Hillcrest Bank. 2Discounts provided as credits on account statement. Visa SavingsEdge is an automated discount program offered by Visa U.S.A. Inc. to eligible businesses and their authorized cardholders that hold an eligible Visa Business card and whose enrollment in the program is accepted by Visa. Under the program, cardholders can receive discounts from participating merchants each time the cardholder uses an enrolled Visa Business card to make qualifying purchases of goods or services pursuant to an active discount offered by the merchant and that transaction is processed or submitted through the Visa payment system (a “Qualifying Purchase”). Visa may modify, restrict, limit or change the program in any way and at any time. Visa reserves the right at any time to cancel the program. Visa also reserves the right to suspend or cancel any cardholder’s participation in the program. Enrolled cardholders will only receive discounts for qualifying purchases that are in full compliance with the terms of the applicable discount offer. Discount offers may be subject to additional terms and conditions. Discount offers may be removed from the program at any time and are subject to availability. Discount offers are also subject to any applicable law or regulation that may restrict or prohibit certain sales. Discounts will not appear on a cardholder’s receipt at the point of sale. Discounts are provided in the form of credits posted to the cardholder’s applicable Visa Business card account. Please visit www.visasavingsedge.com for complete details on the program, including the program terms and conditions. Automatically save your business money when you use your enrolled card. 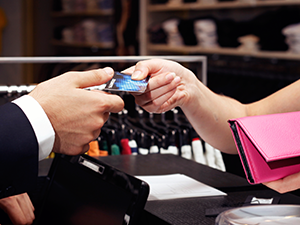 Find a merchant card program that meets your business needs.